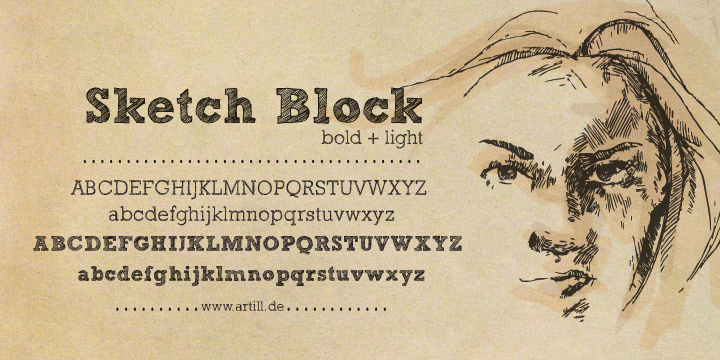 Sketch block is an incredibly designed hand-sketched headline font. The family comprises of a very light and bold weight yet complementing each other impeccably. The humdrum, basic forms of the egyptienne lettering got a charming makeover by the handmade hatching. The designer has paid detailed attention to create impressions of supremacy and tenderness together. The design was solely crafted by hand and then digitized. No wonder the typeface makes for a perfect font to develop the much coveted hand-made character look. It is also capable of supplementing illustrations with typography.